CDI's "Iso Curb" incorporates the latest in design and innovation for the HVAC market utilizing adjustable isolators in a single piece curb system. CDI Curb systems may be fully installed and roofed in prior to mounting RTU/AHU minimizing unaccounted labor time and delays with other "field assembly required" curbs on the market. Prime G-90 18ga weather skirting and bulb style weather seal provide a long lasting solution to the cracking and failing of "other" exposed rubber weather seal designs. All curb systems are subjected to SolidWorks Simulation load testing prior to fabrication accommodating RTU/AHU and all accessories weight and center of gravity insuring a minimum 90% isolation efficiency. Vibration Isolation curb systems are manufactured of 12-18ga (ASTM A653/653M) prime G90 galvanized steel construction. All corners and seams are mitered and fully welded with internal 12ga/A.I. structural cross and vertical supports when necessary. All curb systems are water tight and plenum applications are air tight utilizing internal flex duct. Top of all Vibration isolation curb systems are level with pitches built into curb when deck slopes. 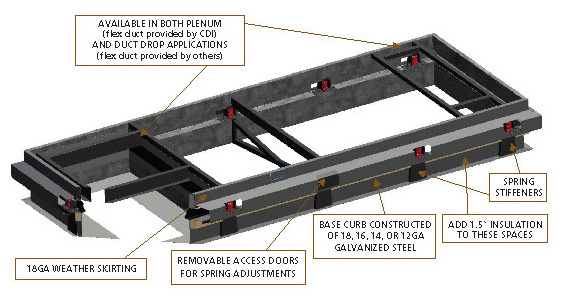 Vibration isolation curb systems are designed to provide a minimum of 90% isolation efficiency with 2" deflection.